Pompeo said U.S. strategy for Afghanistan “is indeed working,” but the next steps must be taken by the Afghan government. “We can’t run the peace talks; we can’t settle this from the outside,” he said. “The region and the world are all tired of what are taking place here in the same way that the Afghan people are no longer interested in seeing war,” he declared. Ghani praised the Trump administration’s regional strategy, including pressure on Pakistan to better control the borders of its notorious tribal region, long a safe haven for Taliban leaders and a breeding ground for militants. “Because of this strategy and the conditions-based nature of it, we, the members of the government, have been able to take bold steps outside the box and articulate an agenda of peace that is truly comprehensive and asks for engagement,” the Afghan president said. Ghani’s government called for a ten-day ceasefire in June to coincide with the Muslim holiday of Eid. The Taliban proceeded to murder 17 Afghan police officers in a predawn attack, then announced its own three-day cease-fire, although it stressed that attacks on everyone it considered a “foreign invader” would continue. U.S. soldier Cpl. Joseph Maciel was killed in an insider or “green-on-blue” attack on Saturday when a traitorous member of the Afghan security force opened fire on his fellow soldiers and American allies. Two other Americans were wounded in the attack. The Taliban said the attacker acted on his own, but added that it “appreciated” his murderous efforts. The Taliban went back to attacking government positions after three days, while the Afghan government formally concluded its own cease-fire on June 30. The relatively peaceful interlude yielded some reports of positive contact between Taliban fighters, Afghan government forces, and civilians, but also included two suicide bombings, one of which was claimed by the Islamic State. 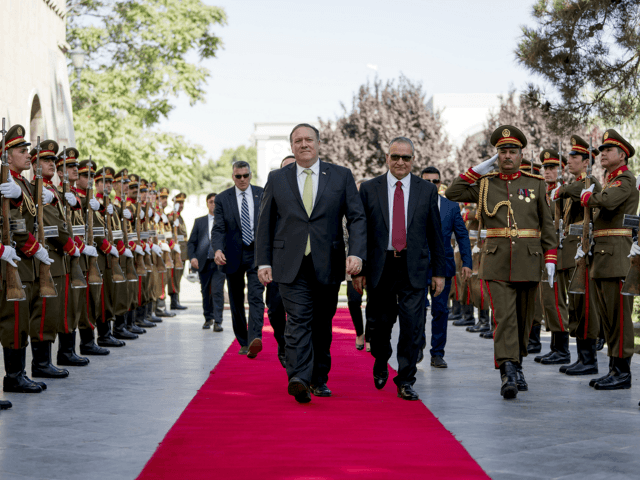 During his confirmation hearings, Secretary of State Pompeo viewed the U.S. role in Afghanistan as a “humble” mission with an “objective of leaving,” but not before threats to American security from the region have been neutralized and the Afghan government is stabilized. The U.S. military believes its operations in the Achin district, site of the “Mother of All Bombs” drop on ISIS caves in 2017, has severely damaged the Islamic State’s logistics in Afghanistan and thwarted its planned assaults on Kabul and Jalalabad. Afghan commandos carried out the operation with support from U.S. special forces and air power. The success of this operation could put the Trump administration in a position to signal that one of its vital objectives in Afghanistan has been met, namely smashing the Islamic State. ISIS is seen as an invading foreign force, its Afghan branch part of a major active threat to American and European security. As Pompeo’s remarks indicated, the Taliban is an indigenous problem for Kabul to resolve with American support, all the more so if Pakistan truly gets serious about controlling its border region.